America entered the 19th century as an agricultural nation of 16 states and 5.3 million people. By the end of the century, the nation was an industrial power of 45 states and 76 million people. This series of eight programs is chaptered into 55 stand-alone segments that highlight significant historical events, scientific milestones and cultural achievements. Historical content is delivered 'on demand' with unprecedented ease, allowing teachers and students instantaneous access to specific information. American History, 19th Century American History, United States History, and 19th Century United States History are emphasized in this first 19th Century Turning Points Program. 00:04:13Washington D.C., the U.S. Capital named for George Washington and designed by Pierre-Charles L'Enfant, was the home of President John Adams and scene to the transfer of power from Federalists to Jeffersonian Republicans. 00:04:01The Louisiana Purchase, which included the Mississippi River and New Orleans, would become known as the Louisiana Territory. 00:03:40The Lewis and Clark expedition or the Corps of Discovery, was led by William Clark and Meriwether Lewis, and used seasoned mountain men to explore the Louisiana Purchase. 00:03:06Robert Fulton, inventor of the steamboat, led American inventors at the start of 19th century, through the backing of American entrepreneur, Robert Livingston. 00:06:04At the Battle of Tippecanoe, Shawnee leader Tecumseh was defeated by General William Henry Harrison. 00:02:23The New Madrid Earthquake affected most of the Mississippi river Rift Valley, changing the river's course in some places. American History, 19th Century American History, United States History, and 18th Century United States History are emphasized in this second 19th Century Turning Points Program. 00:05:43The War of 1812 produced heroes such as Commodore Perry and Dolley Madison, while Fort Miggs was defended by General Harrison and the White House were burned. 00:02:59In the War of 1812, Francis Scott Key wrote the Spangled banner during the siege of Fort McHenry. 00:02:25In the War of 1812, the Battle of New Orleans was won by Andrew Jackson after the Ghent Treaty had ended the war. 00:03:03Washington Irving, the American author, wrote The Legend of Sleepy Hollow. 00:03:05The Santa Fe Trail, opened by William Becknell, was just one of many trails west, including the Oregon Trail, Mormon Trail and California Trail. 00:03:16The Erie Canal, was built by New York governor DeWitt Clinton. 7.) 1826 - James Fenimore Cooper Publishes "Last of the Mohicans"
00:02:23James Fenimore Cooper, wrote Last of the Mohicans, which introduced the archetype character of Natty Bumpo, also known as Hawkeye and Deerslayer, the first truly American character by an American Author. American History, 19th Century American History, United States History, and 18th Century United States History are emphasized in this third 19th Century Turning Points Program. 00:02:46Cyrus McCormick, who invented the mechanical reaper, was an American entrepreneur and an American inventor. 00:03:26Nat Turner, who led a slave rebellion, to end slavery and free slavery slaves, told his story in The confessions of Nat Turner. 00:03:33Chief Black Hawk, who led American Indians in Black Hawk War, which ended in the Massacre at Bad Axe River, also wrote Black Hawk an Autobiography. 00:04:13The Alamo, would introduce American heroes James Bowie, William Travis, and Davy Crockett, in the fight to free Texas led by Stephen Austin. 5.) 1845 - Edgar Allen Poe Publishes "The Raven"
00:02:53Edgar Allan Poe wrote "The Raven", one of the masterpieces of American poetry. 00:02:57The Donner Party, organized by George A Donner, would end in tragedy in the Sierra Nevada Mountains. 00:03:59The Mexican American War, begun by President John K. Polk, was fought to bring Texas into the union and to promote slavery and Manifest Destiny. American History, 19th Century American History, United States History, and 18th Century United States History are emphasized in this fourth 19th Century Turning Points Program. 00:02:38American Scientist, Dr. William T.G. Morton, was the first to use ether. 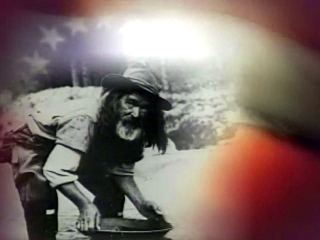 00:04:24California Gold Rush, would lead tens of thousands of 49ers, to look for gold near San Francisco. 00:03:25The Hawaiian Islands under King Kamehameha, helps the American Navy. 4.) 1852 - Harriet Beecher Stowe Publishes "Uncle Tom's Cabin"
00:02:27Harriet Beecher Stowe wrote Uncle Tom's Cabin, the leading Abolitionist tale against, slavery and owning slaves. 00:03:47Commodore Perry in using the American Navy to open Japan, showed the preeminence of the navy. 00:02:08Abraham Lincoln and Stephen Douglas participated in the, Lincoln Douglas Debates on slavery and states' rights before the civil war. 00:04:25The Pony Express and, Butterfield Stage route opened up the American west. American History, 19th Century American History, United States History, and 18th Century United States History are emphasized in this fifth 19th Century Turning Points Program. 00:03:28The Civil War, fought to end Slavery and bring the Confederacy back into the Union was led by Abraham Lincoln. 00:02:40Homestead Act, passed during the Civil War, gave homesteaders a chance to settle the west. 00:02:55The Emancipation Proclamation, ending slavery during the Civil War, was written by Abe Lincoln, to rally the support of abolitionists. 00:03:21During the Civil War, Abraham Lincoln gave his immortal Gettysburg Address. 00:03:23Appomattox, ending the civil war, brought together Confederate General Robert E. Lee, and Union General U.S. Grant. 00:02:39Abraham Lincoln wanted to let the south back into Union easily, but the Abraham Lincoln assassination by John Wilkes Booth would lead to a harsh Reconstruction. 00:03:37The Ku Klux Klan, created to keep blacks in a virtual slavery, was founded by Minor Merriweather. American History, 19th Century American History, United States History, and 18th Century United States History are emphasized in this sixth 19th Century Turning Points Program. 00:03:01Reconstruction brought and scalawags into the south when slavery ended. 00:02:36Known as Seward's folly, Alaska was bought by the U.S. in 1867. 00:04:10Andrew Johnson's impeachment was the first faced by an American Presidency, and would deepen reconstruction, led by abolitionist Thaddeus Stevens. 00:05:49The Transcontinental Railroad, completed at Promontory Point, opened the era of Railroads and American Industrialization, leading to the creation of great railway magnates such as Cornelius Vanderbilt, Jay Gould, and James Fiske. 00:05:26Standard Oil, founded by John D. Rockefeller, would centralize the American oil industry. American History, 19th Century American History, United States History, and 18th Century United States History are emphasized in this seventh 19th Century Turning Points Program. 00:03:01The Chicago Fire, in Chicago, Illinois, was supposedly started by O'Leary's cow. 00:02:27Susan B. Anthony, a leader of women's rights and civil rights, was helped by long time friend Elizabeth Cady Stanton. 00:02:53Robert Smalls, a slave, escaped the South during the civil war and returned to help lead reconstruction. 00:02:12Alexander Graham Bell invented the telephone, another example of the American entrepreneur and the American Inventor. 00:02:58At the Battle of Little Big Horn, George Armstrong Custer was defeated by Crazy Horse leading northern Indian Plains tribes. 00:02:05Thomas Edison, inventor of the Incandescent Lamp, was an American Inventor, who also produced the phonograph and helped found the electric utility industry dominated by General Electric. 00:03:06George Eastman ,founded of Kodak, was an American inventor who created the photography industry. 00:02:47Booker T. Washington founded the Tuskegee Institute and helped to promote civil rights. American History, 19th Century American History, United States History, and 18th Century United States History are emphasized in this eighth 19th Century Turning Points Program. 00:02:56Clara Barton who founded the American Red Cross, was a nurse during the Civil War. 00:02:47The Chinese Exclusion Act impacted Chinese American Civil Rights. 3.) 1885 - Mark Twain Publishes "The Adventures of Huckleberry Finn"
00:02:33Mark Twain, who wrote The Adventures of Huckleberry Finn, was one of the 19th century's American Humorists, whose real name was Samuel Clemens. 00:02:07The Oklahoma Land Rush gave Indian Lands to white settlers and would lead to the creation of the state of Oklahoma. 00:02:09The building of the automobile, by American Inventors, Frank Duryea and Charles Duryea would lead to the American automobile industry. 00:02:44In Plessy v. Ferguson, Segregation and Jim Crow were held up by the U.S. Supreme Court, of which only John Marshall Harlan stood for Black civil rights. 00:04:01The Sinking of the Maine launches American imperialism to take over Cuba, the Philippines, Guam, Puerto Rico and destroys the Spanish fleet and makes the reputation of Teddy Roosevelt.